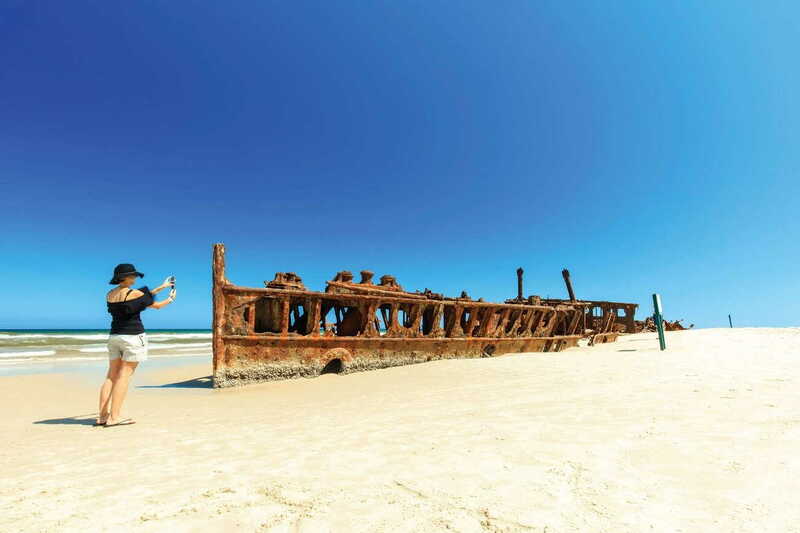 Experience the stunning natural beauty of Fraser Island, the largest sand island in the world. Over two days, you’ll have the chance to explore the local wildlife, take walks, and discover some of the incredible landmarks on the island. You’ll stay on the impressive 75 Mile surf beach and visit a selection of eggshell-smooth lakes and lush, ancient rainforests. This tour does not carry children under 5 years. On the first day, we’ll leave Brisbane, Noosa, or the Sunshine Coast and take a 4WD adventure past the Glass House Mountain. From there, it’s onto Double Island Point and the mesmerising coloured sands of Rainbow Beach before we stop off for a picnic-style lunch. There’ll be plenty of time for you to kick back and relax on the beach or dip in and out of the artisan shops. 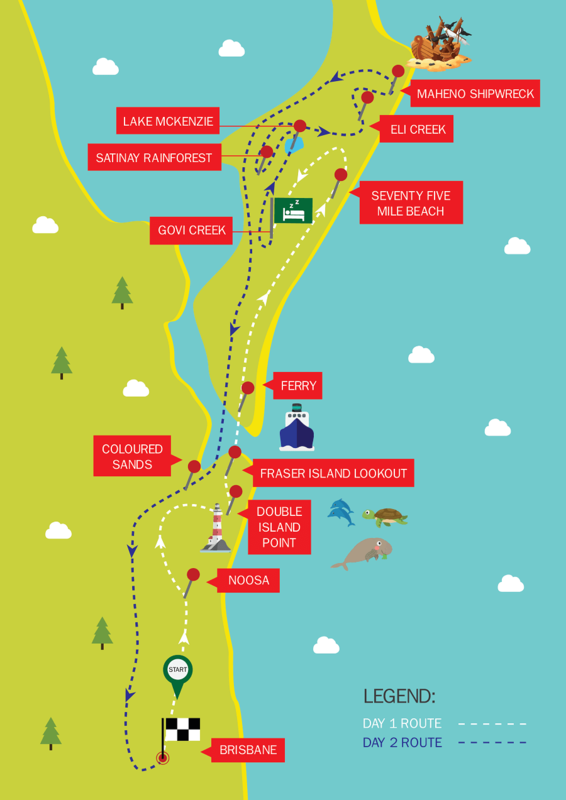 Then it’s time to head to Fraser Island via ferry, where you might be able to spot dolphins, turtles, dugongs, and sharks as they frolic about in the ocean. 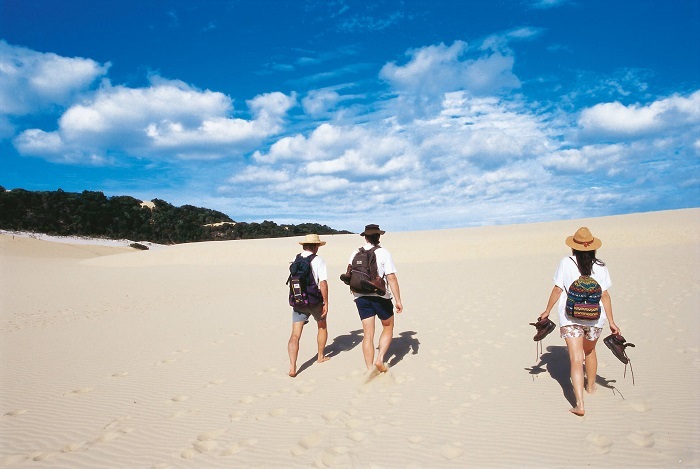 Our first adventure on the island is a 4WD trip along 75 Mile Beach, one of the island’s most famous attractions. As the afternoon draws around, we’ll head to the National Park Cabins that sit on the edge of Govi Creek estuary. Here, you can enjoy the beach, try surfing, or visit Lake Wabby with its impressive sand dunes and eclectic selection of wildlife – keep your eyes peeled for huge water lilies, vibrant bird species, and turtles. On the morning of the second day, you’ll have time to explore your surroundings: watch the sunrise, try your hand at surfing, or go in search of the resident dingoes. 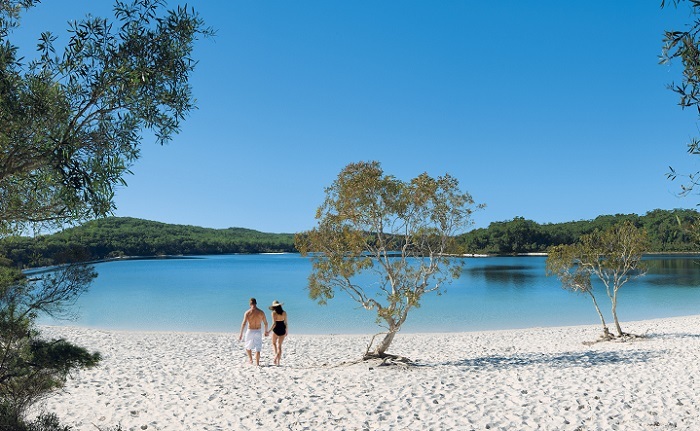 After breakfast, we’ll head straight to Lake McKenzie, where you can spend the morning before the crowds roll in. Here, you can swim, hike, and take photos of the stunning lake and its wildlife before we move on and take a stroll along a rainforest boardwalk. Along the way, you can see giant King Ferns, explore the World Heritage Satinay forest, and soak up the crystal clear waters of Wanggoolba Creek. We’ll tuck into a picnic lunch and then take another 4WD to Eli Creek to see the Maheno Shipwreck. Don’t forget to snap some photos of the nearby Coloured Sands and the Pinnacles while here, before we head back to Noosa and Brisbane. Please note: tour price does not include national park fees, daily permits or ferry fees. An additional $60 per person is required to be paid in cash on the day of the tour.